I knew if I stalled long enough I wouldn't have to worry about voting on the Zombie Hulk. I've been troubled by it's reverse bonding in a 60 point unit, but now I'll get a real chance to look at its balance. dok's Zombie Hulk has received 4 YES votes and moves on in the process. wriggz's Raven's Claw has received 3 NO votes and is removed from the process. Last edited by Killometer; December 4th, 2010 at 02:09 PM. I would like to nominate krysto2002's Blood Raptor. After reading through the posts, it seems most judges like this. I really like it and might end up using it if it passes through. I looked it up and on auggies it is the #09 Bloodseeker from Dangerous Delves, priced at $.69. Special Attacks are severely modified by death. Trade Thread Selling most of my collection! Before you go and no these to pieces, please note that both have been revised and edited, as well as evened out to some degree. Hope you like them, both units are available from auggie's at about 2 for $1. 1. Nominations are limited to one per post. Which one would you like us to consider for review? I vote yes to review krysto's Blood Raptor. My sense is the sculpt is fairly small but I'm curious about its size & base (regular single hex base, I'm assuming) before playtesting, assuming we get that far. Ah, the Bloodseeker Drake, which in fact can actually be bought for prices as low as $0.50 each, is actually perfectly sized for scape. It fits nicely on a standard base and is accurately measured on the card as having a height of 3. If there's anything else it could use, I'd say climb x2 due to its moderate move value, but that's not really necessary. From tail to head he's about as long as the diameter of a single hex (from one corner to the opposite corner). Like I said, nicely sized for scape. Sometimes, you just have to start over. I like this card and concept. I vote YES to review Blood Raptor. NOTE- They cost 120 points, I will try to update the card soon. Your images were messed up but I fixed them. Last edited by tcglkn; November 27th, 2010 at 06:26 PM. i cannot see any info on them, i cannot make them larger. Looks like it's all 4 cards? 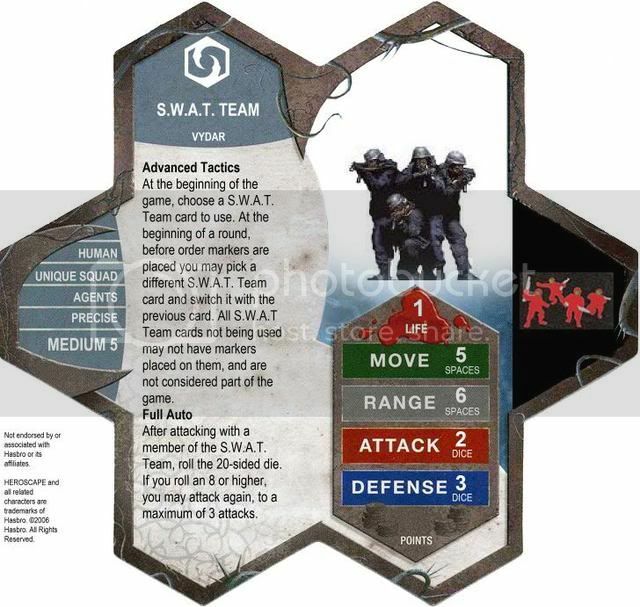 There's 4 version of the SWAT team, and at the start of the round you choose one to use for the rest of the round. So one round you can have Deadly Shot, and the next you can choose to have Shotgun Blast Special Attack, etc.